This section describes the system configuration tool 'msconfig.exe' that can be used to manage system startup process and settings. 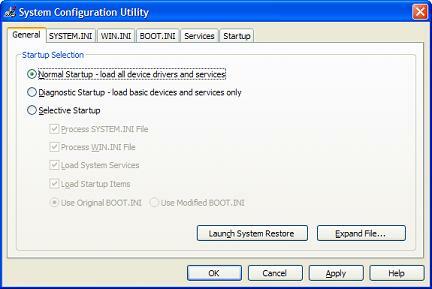 Change system startup options: Normal Startup, Diagnostic Startup, Selective Startup. Change selective startup steps: Process SYSTEM.INI, Process WIN.INI, Load System Services, Load Startup Items, Use BOOT.INI. View and modify SYSTEM.INI, WIN.INI, BOOT.INI. Quick access to the System Restore tool. Enable/Disable Startup Programs with "msconfig.exe"